Only hydrocephalus and dwarfism tests generated by FHH or FHANA will be accepted by FHH. This is so that we can verify that the hair tested matches the parentage DNA we have on file. Late in December 2017, DNA testing for dwarfism and hydrocephalus became available to FHH, to test horses with Friesian lineage. FHH is encouraging testing and making an effort to educate purebred Friesian and part-bred Friesian horse owners on the dangers of breeding two carriers together. The purpose of the testing is to help avoid the heartbreak and financial loss of producing a dwarf or hydrocephalic foal. Starting in 2018, carrier status codes will be added to all FHH pedigrees. For horses being registered FHH, a note advising testing will be added to the registration document, when the carrier status of the horse(s) with Friesian lineage is not known, or when there is risk, due to a known or suspected carrier in the pedigree. Codes printed on FHH pedigrees are based on current information that was believed to be accurate at the time of printing, but may be subject to change, as information is updated daily. Pedigree indicates testing is not necessary. Tested as NOT a carrier for dwarfism or hydrocephalus. Was tested as a carrier of BOTH dwarfism and hydrocephalus. Was tested as a carrier of dwarfism, but negative for hydrocephalus. Was tested as a carrier of hydrocephalus, but negative for dwarfism. Testing is not necessary for dwarfism, tested as a carrier of hydrocephalus. Testing is not necessary for hydrocephalus, tested as a carrier for dwarfism. Suspected to be a carrier of dwarfism. Suspected to be a carrier of hydrocephalus. Because of inbreeding, dwarfism and hydrocephalus, are prevalent in the Friesian breed and can affect both purebreds and crossbreds. At this time, the KFPS allows horses to be carriers. Eliminating carriers from breeding would make the available gene pool even smaller, possibly creating further inbreeding issues. The carrier status of KFPS Approved stallions, from 2014 on, is published by the KFPS. However, it is important to be aware that the status of KFPS stallions approved before 2014, non-approved stallions and mares is frequently unknown. Therefore, it is important to test, to prevent tragedy. Dwarfism and hydrocephalus are two separate genetic issues! You could (in theory, but not recommended) breed a hydro carrier to a dwarf carrier, with no risk of the abnormalities actually occurring. Although rare in other breeds, hydrocephalus has been reported in Standardbreds, Orlov Trotters, American Miniatures, Hanoverians and Thoroughbreds. Thoroughbreds and American Minitures are also known to occasionally carry dwarfism. However, the testing that FHH is offering is specific to the Friesian breed. It was developed with the use of Friesian DNA. During the resurrection of the Friesian breed, dwarf mares were sometimes used for breeding. This practice was occurring as late as the 1990's. Since genetic testing was not yet invented, and most of the foals were healthy and appeared perfectly normal, breeders of these foals probably did not know that the mare they were breeding was passing on dwarfism to 100% of her foals! 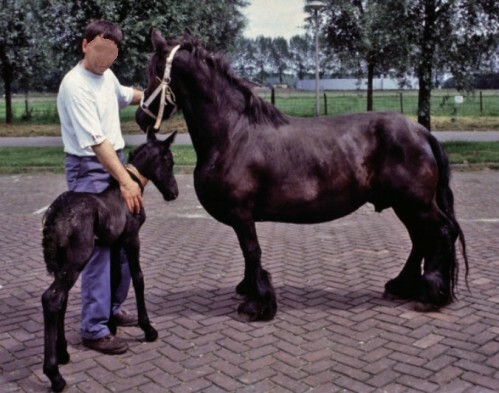 Even with the breeding practice of using dwarf mares, and in-breeding, hydrocephalus seems more prevalent than dwarfism. As occurrences increased with the breeding of related horses, a hypothesis was probably formed that in-breeding was not a good idea. This probably lead of the creation of the in-breeding co-efficients. While certainly helpful, in-breeding co-efficients are not good predictors of health issues. Being a carrier does not affect the health of your horse! ● It is only if you breed this horse, that carrier status matters. ● If your Friesian or part-bred Friesian is a carrier, they can still be used for breeding, but to avoid the risk, the status of all mates with Friesian lineage must be known, before breeding. ● If you breed to any horse with Friesian lineage, you will want to have DNA test PROOF that the partner horse is NOT a carrier also. Be careful of false testing reports. Ask to see the report or call the registry. 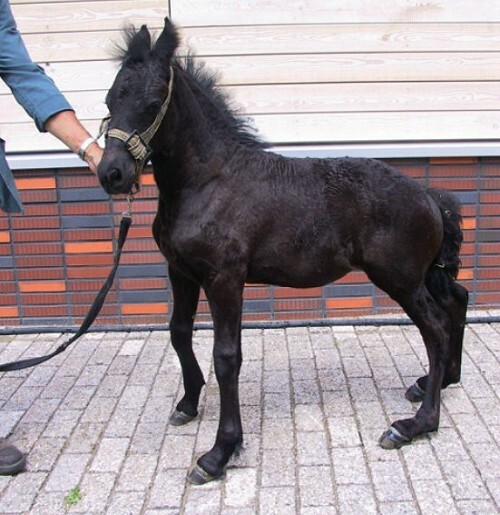 ● If you breed to another carrier parent, the foal has a 1 in 4 (25%) chance of having dwarfism or hydrocephalus. 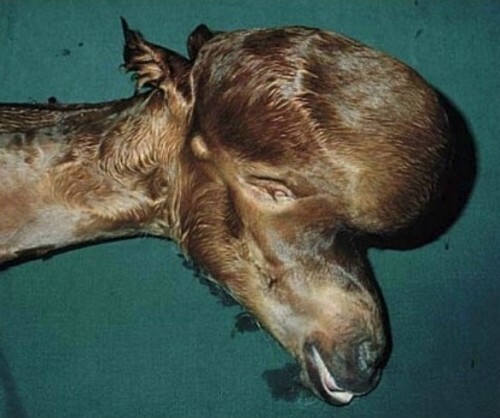 ● Hydrocephalus often causes the mare to abort the foal early. If the foal is carried to a point that is closer to full term, this causes a great risk to the mare, as abnormal deliveries are common and this can result in death of the mare. ● Dwarfism foals are physically affected and many have problems that can result in having to be humanely euthanized. ● Keep in mind that any carrier parent will pass on the genetic mutation to approximately 50% their foals, even if the other parent is clear or regardless of the breed. So, if you plan to breed offspring from carriers back to Friesian lines, they should tested first. If you have any questions, please call our office at 877-653-1341. Sorry, we do not know the origin of the photos. These photos are being used for educational purposes only. Dwarf Friesian foal. Notice the leg and rib cage deformities. Dwarf Friesian mare with her normal foal. 100% of this mares foals will carry dwarfism.